The validated media and supplements are manufactured under full cGMP conditions and fulfill CE regulations. Quality and regulatory accordance is a matter of course, as Irvine Scientific® is grounded in assisted reproductive technology (ART), cytogenetic applications and industrial cell culture. Irvine Scientific® experts in R&D, manufacturing and regulatory affairs are gladly available to assist you with your project. TRINOVA BIOCHEM is the distributor for the PRIME-XV® Cell Therapy Media Portfolio in Germany, Austria and Switzerland. For over 25 years, Irvine Scientific® has been a world leader in providing a comprehensive range of prenatal, diagnostic, and cytogenetic products to the healthcare community. 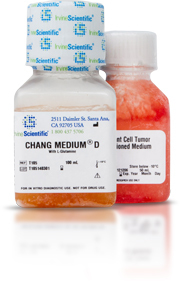 CHANG Medium® is the considered to be the gold standard for cytogenetics application. As Distributor for Germany, Austria and Switzerland TRINOVA BIOCHEM offers a range of media for culturing amniotic fluid cells, chorionic villi sampling or tissues using either flask or in situ methodology. In postnatal cytogenetics, we offer media for the culturing of bone marrow aspirates and peripheral blood cells.